Palm trees are the most popular trees mostly found in the Pacific Ocean, southeast US (United States), South Africa and Asia. They are very skinny trees that come with a reed resembling a trunk. Some types of palm trees look like a bamboo tree. In order to Draw Palm tree pencil drawing, you need to follow step by step procedure. The top portion of palm trees has two different types of looks such as human hand and big feathers. It is vital to note that these palm trees are sometimes considered as mops. Few types of palm trees make fruit and others grow berries, few grow dates and few coconuts. People love nature and love to draw nature. You can also check- How to draw a rose step by step from here. The palm trees are truly easy to draw, but a small amount of concentration is required to drawing an accurate image. 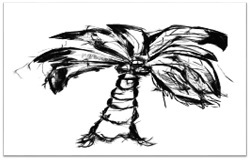 If you do not have a proper idea about palm tree drawing, you can utilize these following procedures that make the palm tree drawing much easier. When you decide to draw the palm trees, you can learn the procedures to complete the drawing properly. The following guide comes with many simple-to-follow guidelines and simple steps that help you to draw a palm tree without facing any difficulties. You can start the drawing task with the trunk. You can sketch a faintly curved line of suchlike the length you actually want. You can feel free in order to make many lines and then pick that one line you like well. Along with this, you can also sketch another line roughly about 1 inches of similar length and properly bend it in for making the trunk of palm tree skinner because this goes up. In this step, you can sketch in the short lines loosely that link the correct two lines. You can curve the lines in order to match its trunk curvature. You do not be very particular, it can be very close or far away as you actually like. You can paint in few outlines of fronds, creating as much as you want. They are type of like banana shapes or teardrop shapes. If you require any help, you can refer this above picture. After that, you can draw one line exactly straight down the center portion of every leaf. It is one of the major steps in drawing a palm tree, but it is difficult to explain. If you face any difficulties while understanding this step, you can follow these pictures that let you get a clear idea about drawing this portion. You can start defining and shading each and every portion, making the highly pronounced hit for every segment. After that, you can shade effectively along that bend. And then, you can erase the harsh lines present in the center portion of the palm tree which may disrupt its flow. The above images help you to complete this step without any confusion or difficulties. You can use 6B pencil in order to make the poky and rough edges along every frond. You can make this as sloppy or as neat as you like, much like sloppy as it looks cool and more natural. After that, you can give dark shade to the center lines of every front. Then, you can connect every spike to the frond center. You are completed. You can fix up all details you draw or like more until finding the method you prefer. You can keep it mind that a proper focus and additional concentration helps you to draw the palm trees in an accurate manner. You can keep practicing and trying until you are fully satisfied with the image what you are drawing. I hope above article on Palm tree pencil drawing would help you.